Upper Cervical Chiropractic Care is a unique and often overlooked health care solution. We focus on the source of your condition and not the symptom itself. Upper Cervical Chiropractic Care is based on the universal law of cause and effect: For every effect or symptom (physical or mental), there must be a definitive cause. Upper Cervical doctors focus their efforts on locating and removing interference to the nervous system that may be the cause of your health condition. Removing this interference can allow the body to heal itself naturally without the use of potentially harmful drugs or surgery. Our doctors focus on the Upper Cervical Spine, which houses the Brainstem, the Master over all the nerves and the brain. At our practice, we couple the benefits of upper cervical chiropractic care with the benefits of chiropractic neurology. Since its beginning, the chiropractic profession has been interested in the integrity and preservation of nervous system function. Therefore, it is paramount that we assess the neurological state of each patient at the brain, brain stem, and spinal cord levels. This practice allows our doctors to catch a malfunctioning nervous system that may have originated in the brain itself. Our centers focus on finding that miscommunication between the brain and the body so the body is able to heal itself. Upper cervical chiropractic care and chiropractic neurology are non-invasive procedures. All neurological exams and upper cervical malfunction patterns (subluxations) are reassessed periodically throughout care to objectively document patient improvement. At UCCNC we want you to receive the most that you can out of your care. In order for you to receive the best care in the world, it will help you to understand the scientific basis of what we do and why we do it. In other words you must understand the How, Where and Why. The story begins directly after conception. The very first system in the body to develop is the nerve system, more specifically the Central Nervous System or CNS. The CNS is comprised of the Brain, Brainstem, Cerebellum, and Spinal Cord. As the brain is growing at a rapid rate it will give signals for the brainstem, cerebellum and spinal cord to grow. When the CNS is near complete, the brain will give signals for the spinal cord to grow 31 pairs of spinal nerves. Once the 31 pairs of spinal nerves are complete the brain then sends signal, by way of the Brainstem, Cerebellum and spinal cord to make all of the vital organs in the body. Truly we are all brain everywhere, only for anatomy sake we separate it into different parts. Isn't that amazing? Now let us continue on in our story. The Brain now knows it needs to protect this extremely delicate system of 70 trillion nerve cells by encasing the entire system in bone. The Skull protects the Brain, Cerebellum and Brainstem and the Spinal Cord is protected by the vertebrae of the spine. Next the brain realizes it needs to be able to move itself around, so it sends signal primarily to the cerebellum through the brainstem to make muscles and ligaments so it is able move arms and legs, hands and feet. And last but not least, the ligaments surrounding your spine. How can Subluxation cause health problems? As the brain is communicating with the rest of the body through the nerve system, the misalignment of the bones, especially the top two vertebrae of the spine, the body’s posture is affected. As the body reacts to and twists itself to compensate or right the head, there can be many thousands of nerves which are entrapped and messages hindered to organs and tissues. At each level of the spine, the nerve roots go out to different organs. Below is a list of the sites of the nerve roots and the vertebrae with corresponding organs and tissues which can be affected. 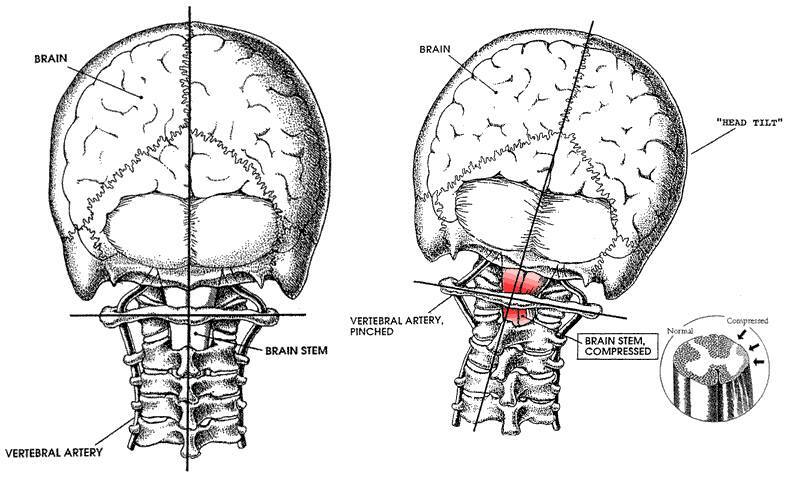 As you can see, when the upper cervical spine is misaligned, there can be numerous affects to the rest of the body. Through the proper realignment of the upper cervical spine, the posture is restored and pressure is removed from the nerve system. This allow the body to resume proper communication between the brain and the rest of the nerve system. This never chain originates from C4, 5, 6, 7 and T1. It forms the Median, Ulnar, and Radial nerves that control the shoulders, upper arms, forearms, hands and fingers. This is why some people have problems in their shoulders, elbows and wrists. It is possibly coming from a pinched nerve at the cervical or neck area. The bottom of the spine. The hips or pelvis attach to the sacrum to form the top of the legs. The Sacrum area has five segments, which are fused together. The Coccyx is the tail bone at the very bottom of the spine. The Sciatic nerve branches out at about seven different levels from the lower lumbar into the sacrum. This nerve is the largest nerve in the body and runs from the lumbar area all the way to the tips of your toes.